High wind and blowing dust delayed my departure from Tucson a day. So Beth and I used it to visit the Desert Museum. No dust up there. We got there just before the first raptor free flight presentation, so headed in that direction. On the way we passed through the "mountain woodland" area and met a mountain lion. They have created wonderful habitats for the animals here. This is the black bear habitat...can you find him? He's sleeping on a ledge to the right of the tree. Great horned owl. The free flight birds are just that...free. Not banded or tethered in any way, and can leave if they want. They call them volunteers. This is a Prairie Falcon. The Peregrine Falcon decided to go hunting and did not show up for his performance. The Red-tailed hawk (bottom) got distracted by a Cooper's Hawk (top) that is nesting in the area. The Cooper's Hawk kept bombarding him because he was flying near the nest. After the raptor presentation we walked around looking at the desert plants and animals. 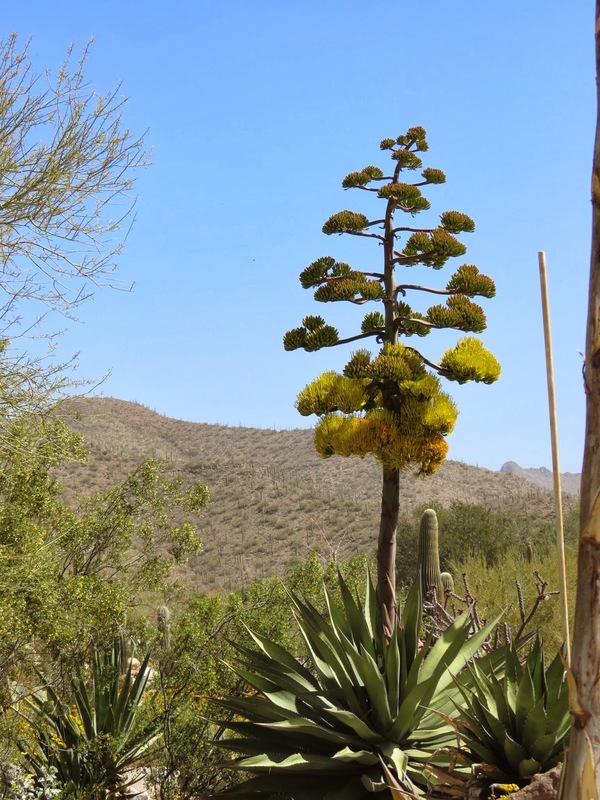 This cactus is just beginning to bloom. I noticed something sitting atop the highest rock. But if you look closely, there's also a lizard on the rock to the left, and another one on the right. Not sure what the name of this lizard is. The one on the left started to move. Over to the rock under the Roadrunner. The Roadrunner followed the lizard. The lizard crawled through a crack. The lizard crawled up to join the other lizard. The Roadrunner gave up the chase. This area shows underground habitats...animals you usually don't see. 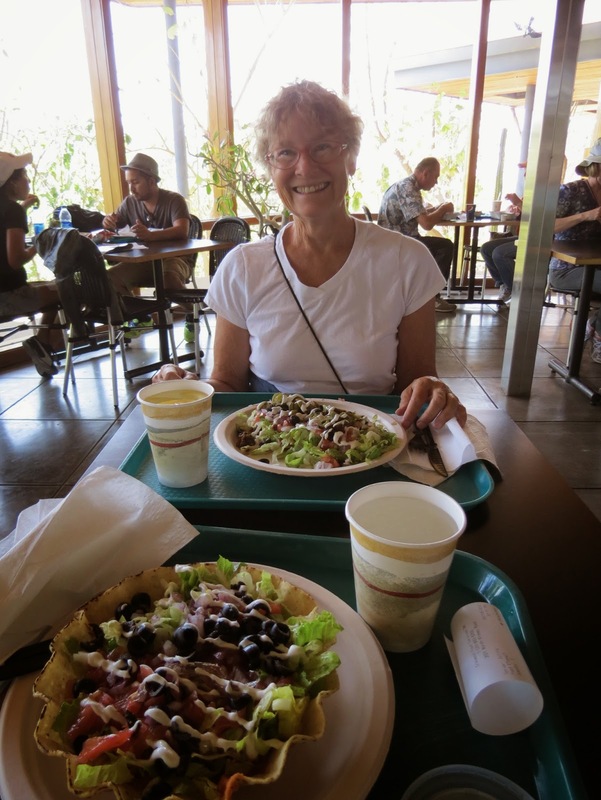 There's a restaurant at the Desert Museum, so Beth and I had lunch there. I had Taco Salad. After lunch we visited a couple of walk-in aviaries. In the Hummingbird Aviary, mating and nesting were going on. Can you see the baby's beak? The nest is made from cobwebs. The Broad-billed Hummingbird builds a more elaborate nest. Not sure if he was going after the nesting material in the bag, or the man's hair? The Stellar's Jay is not new to me, but I haven't seen one in awhile. On the way to the afternoon Raptor Free Flight, we passed some Desert Bighorn Sheep. I love his striped bloomers. That's not all....We did not see it all. You can not see it all in a day. And you can go every day and see something different. But that's all for now. Good Night! Your photos are SO amazing, Liz. We went to this museum early in February, but our photos don't hold a candle to yours. What kind of camera do you have? Thanks for sharing your beautiful images! Canon SX40 HS with 35X optical zoom. Easy point and shoot. Fantastic as always Liz. This is such a neat place. I was here a few years ago and would like to go again.